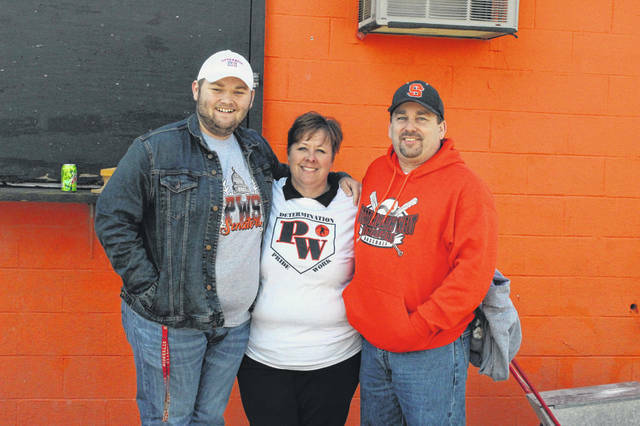 Andy and Alec Arnett pose with Portsmouth West softball coach Dani Coleman at Saturday’s super scrimmage for area softball teams while helping raise money for the Angela Arnett Memorial Scholarship fund for Portsmouth West students. WEST PORTSMOUTH – Cancer is something that transcends all walks of life. No matter your race, class, socioeconomic status, gender, age, or any other earthly categorization, we all know someone in our lives that has had to suffer through this terrible disease. For the Arnett family, they know all too well about the toll cancer can take. Following the passing of Angela Arnett in 2014, the Arnett family was determined to continue her memory, even after she was taken due to that terrible disease. That is why they, along with the help of West softball coach Dani Coleman and other friends and family members, established the Angela Arnett Memorial Scholarship, a scholarship Portsmouth West students are eligible for upon their graduation to help fund their secondary education. Coleman, being a close family friend to the Arnett’s, naturally felt compelled to help increase the scholarship fund. That, and Angela’s love of softball, are two of the main reasons for why Coleman began the super scrimmage three years ago that the Senators hosted on Saturday at Doc Singleton Park that brings together 23 teams from all across Southern Ohio. Being able to hold Saturday’s event in memory of Arnett’s passing and to help raise money for the scholarship, while also being able to bring together southern Ohio’s best softball talent means the world to Coleman and the Arnett family. Donations were accepted from anyone who wished to attend the super scrimmage on Saturday, as well profits reaped from sales at the concession stand that will be given to the Angela Arnett Memorial Scholarship fund. As for Coleman’s group of Senators, she fully expects a competitive team for the upcoming 2019 season after the hunger and desire to play she’s seen her girls exhibit in their scrimmages prior to the season. Donations to the Angela R. Arnett Memorial Scholarship fund to help financially assist Portsmouth West graduates who plan on attending college can be made at https://www.aradiamondscholarship.com/.